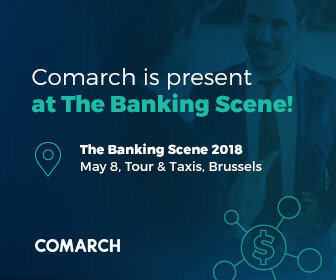 Comarch participates in The Banking Scene! We are a proud sponsor of The Banking Scene! It is a one-day conference for banking and fintech professionals, held on the 8th of May in Brussels. The Banking Scene originated in 2017. The first edition gathered more than 200 finance professionals. They discussed the future of banking and debated over key issues facing the sector. Following the success of the event, the second edition has been announced. The event brings together visionary leaders and focuses on most innovative projects. It is a great opportunity to establish contacts and exchange experiences. Comarch delegates will take part in the event and we kindly invite you to visit our stand. Our team is willing to answer any questions you may have. We look forward to seeing you there.